In addition to reducing monthly energy bills, residential solar panels can continue powering your appliances and lights during times of electricity disruption. Many people living in geographical areas prone to weather extremes rely on solar panels as a backup electricity source. In addition, harnessing ultraviolet light for energy use is a cost-effective, renewable and clean energy source that emits no pollution while significantly reducing a family's carbon-footprint size. Solar panels are constructed of individual photovoltaic cells that absorb the sun's radiation and convert that radiation into electricity. After cutting tiny disks of crystaline silicone less than one centimeter in height, manufacturers of solar panels polish and gloss over any fine scratches occurring during the slicing procedure. These silicone cells then receive a coating of "dopant", a substance that facilitates the conversion of radiation to electricity. Solar panels are protected by a thin layer of glass bonded over cells and finally connected to a substrate using a cement designed to enhance thermal conduction. This prevents the panel from overheating when exposed to direct sunlight. Functioning like semiconductors, these cells utilize a large-scale p-n junction diode that instantly changes the photons constituting sunlight into usable energy. Photon energy pushes electrons out of orbit around atoms, effectively releasing the electrons so that they begin moving in a one-direction current. Metal contacts within each solar cell act as conduits to generate electricity from these liberated electrons. Solar panels containing large numbers of solar cells will produce more electricity than smaller panels due to this "photovoltaic effect" on electrons. Horizontal insolation measures how much sunlight is received by a residential solar panel. It can be determined prior to purchasing panels by measuring how much radiation a flat object receives, such as a rooftop or swimming pool. Depending on the geographical location of an Old Northeast home, the horizontal isolation number can vary greatly, especially if a homeowner lives in temperate North America. However, determining this number is helpful in understanding how effective a solar energy system will be once installed in the home. Additional factors influencing the efficiency of solar panels include common weather conditions, environmental items creating obstructions to sunlight and the position/angle of an installed panel. Optimization of residential solar panels is accomplished by employing dynamic mounts when placing solar panels on rooftops that can be rotated in order to capture the maximum amount of solar radiation. The amount of money saved from using residential solar panels depends on several factors, such as a home's total electricity consumption, number of direct sunlight hours per day, angle and size of a home's roof and community electricity rates. How large a solar energy system is also impacts yearly savings on energy bills. 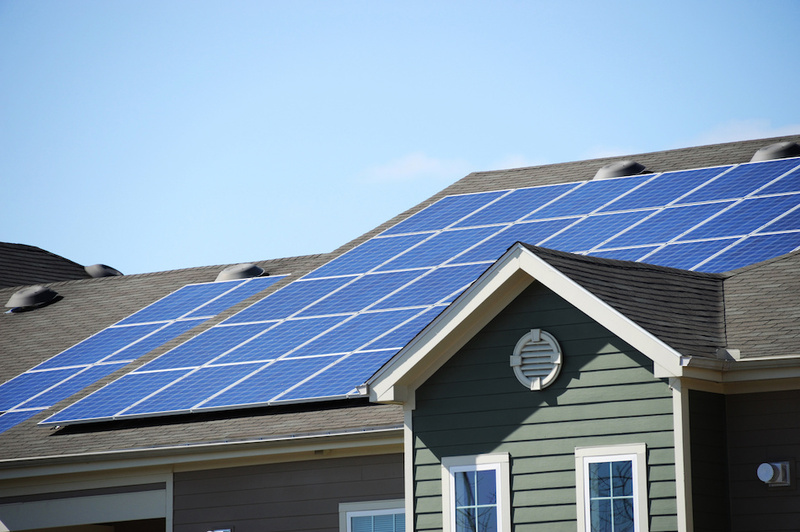 The real estate market views residential solar panels as upgrades or improvements to a home. The Lawrence Berkeley National Laboratory has shown that adding solar panels to a home raised the home's value by an average of $15,000. As solar panel technology and ease of installation improves, experts expect homes equipped with solar energy systems will enjoy an even higher value when placed on the market, much like homes that are properly staged to appeal to buyers. Solar Panels Work Everywhere in the U.S. According to the U.S. Department of Energy, only one hour of midday sun equals the yearly demand for electricity in the U.S. All areas of the U.S. receive at least several hours of sunlight every day (except parts of Alaska). In fact, U.S. solar resources are rated "good" to "excellent". Finally, residential solar panels significantly reduce emission of CO2 and other greenhouse gases like nitrogen and sulfur oxides while also decreasing water withdrawal and consumption since photovoltaic cells do not use water to generate electricity.